Finally! The big week is upon us! I don’t know about you all, but I can’t wait for the holiday eating frenzy to blow over. Everywhere I look, junk food is taunting me with its sugary, buttery, decadent deliciousness. I’m seriously considering doing a second round of the Conscious Cleanse in January to reset my metabolism and shed a few pounds. I have many fond memories of Christmas growing up, but they can’t all be winners. One year my sister, Lyneé, caught on fire! We had both received new flannel pajamas from Santa and naturally we had to try them on right away. A little later when Lyneé was passing me my breakfast plate, she leaned over a candle on the table and momentarily burst into flames. She’s okay, but sadly the pajamas didn’t fare so well… Another year, when I was in college, everyone in our house came down with the flu except for Mom. It hit me while we were opening gifts on Christmas morning, and it was a few days before I was able to finish. Not exactly happy stories, but we laugh about them now all these years later. As I prepare for my annual trip home, I am looking forward to sharing some down time with my family and friends. Like many of you, I imagine, I’ve been crazy busy the past few weeks. With that in mind, I’d like to share a quick, easy breakfast recipe that’s sure to wow your Christmas houseguests. 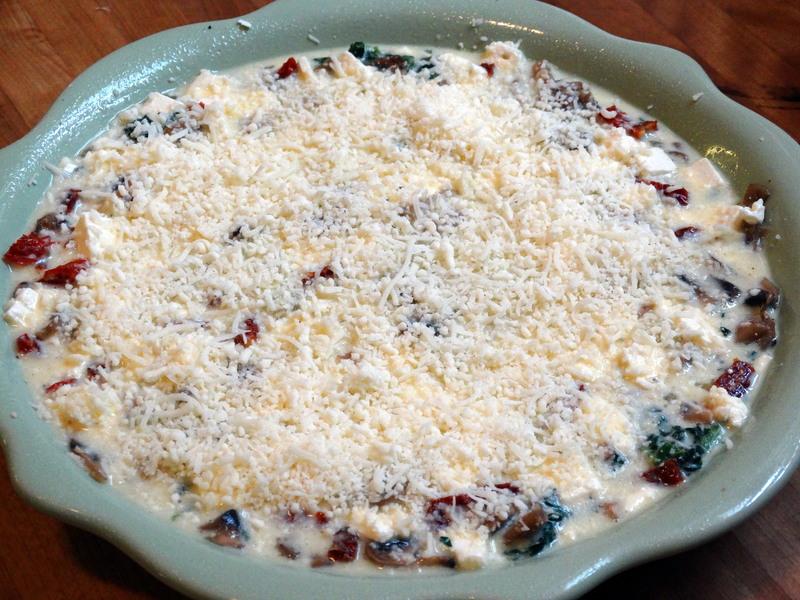 You will need a bit of non-stick cooking spray, frozen chopped spinach, fresh mushrooms, garlic, sun-dried tomatoes, eggs, milk, crumbled feta, shredded parmesan and mozzarella cheeses, salt and pepper. Preheat your oven to 350 degrees. Add 10 ounces frozen chopped spinach (thawed) to a mesh colander, letting it drain while you prepare the other ingredients. 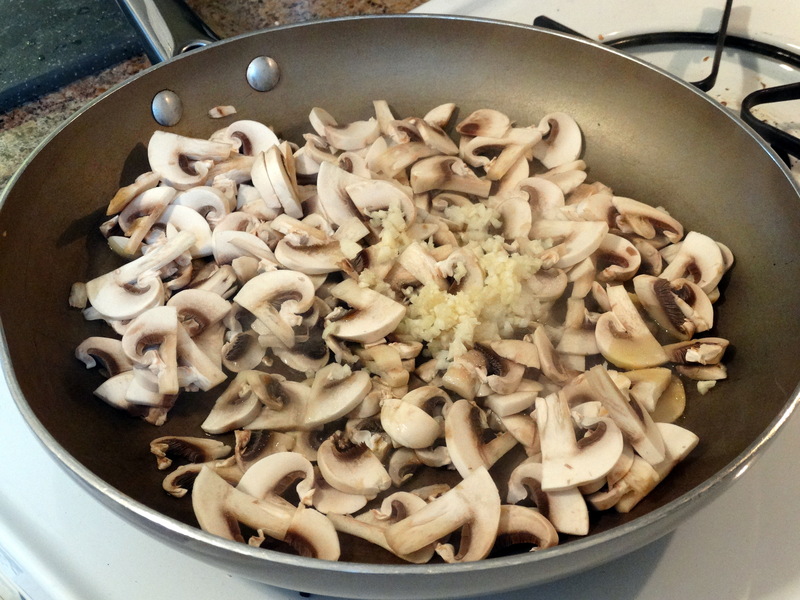 Wash 1/2 pound fresh mushrooms (white or baby bella), thinly slice them, and place them in a non-stick skillet coated with cooking spray. Add 2 minced garlic cloves, along with a bit of salt and pepper to taste. Heat over medium-high heat until the mushrooms are softened and the moisture has evaporated from the pan, about 10 minutes. While the mushrooms are cooking, chop 1/4 cup sun-dried tomatoes into thumbnail-sized pieces. If you can’t find loose sun-dried tomatoes, you can use jarred, but make sure to drain them well and pat the excess oil off them with paper towel. Spray a 9″ pie dish with non-stick cooking spray. Use your hands or a towel to squeeze the remaining moisture from the spinach. Sprinkle the spinach in the bottom of your pie dish. 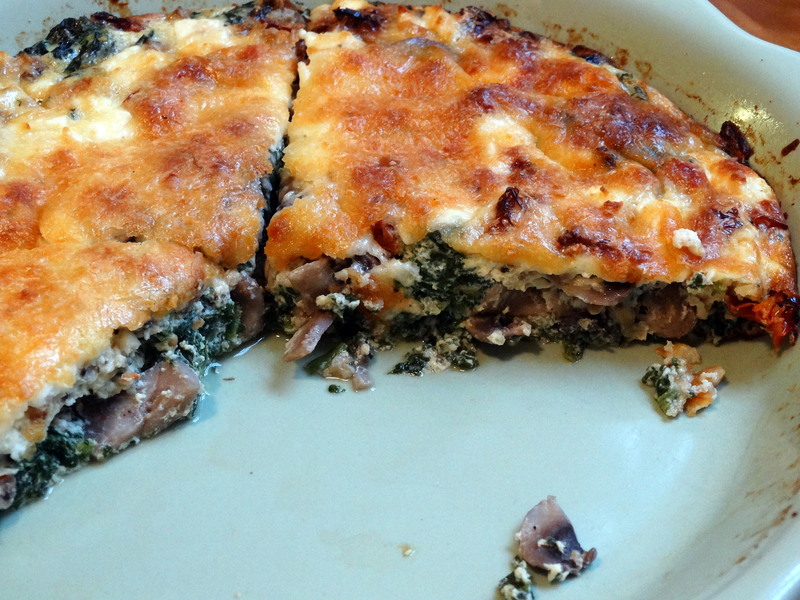 Top the spinach with the mushrooms, sun-dried tomatoes, and 2 ounces crumbled feta cheese. It’s starting to look pretty amazing at this point, isn’t it? In a medium bowl, whisk together 4 eggs and 1 cup whole milk. Pour over the veggies in your pie plate. Add a bit more salt and pepper if you’d like. Sprinkle the top with 1/4 cup shredded parmesan and 1/2 cup shredded mozzarella. Bake in the oven for 55 minutes, or until the top is golden and the center is firm. Let cool for 5-10 minutes prior to serving and enjoy! Wishing you all the happiest of holidays and a Happy New Year! 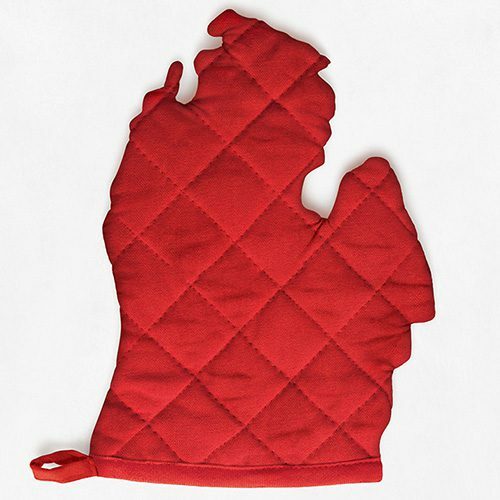 1) Preheat your oven to 350 degrees. Add 10 ounces frozen chopped spinach (thawed) to a mesh colander, letting it drain while you prepare the other ingredients. 2) Wash 1/2 pound fresh mushrooms (white or baby bella), thinly slice them, and place them in a non-stick skillet coated with cooking spray. Add 2 minced garlic cloves, along with a bit of salt and pepper to taste. Heat over medium-high heat until the mushrooms are softened and the moisture has evaporated from the pan, about 10 minutes. 3) While the mushrooms are cooking, chop 1/4 cup sun-dried tomatoes into thumbnail-sized pieces. If you can’t find loose sun-dried tomatoes, you can use jarred, but make sure to drain them well and pat the excess oil off them with paper towel. Spray a 9″ pie dish with non-stick cooking spray. Use your hands or a towel to squeeze the remaining moisture from the spinach. 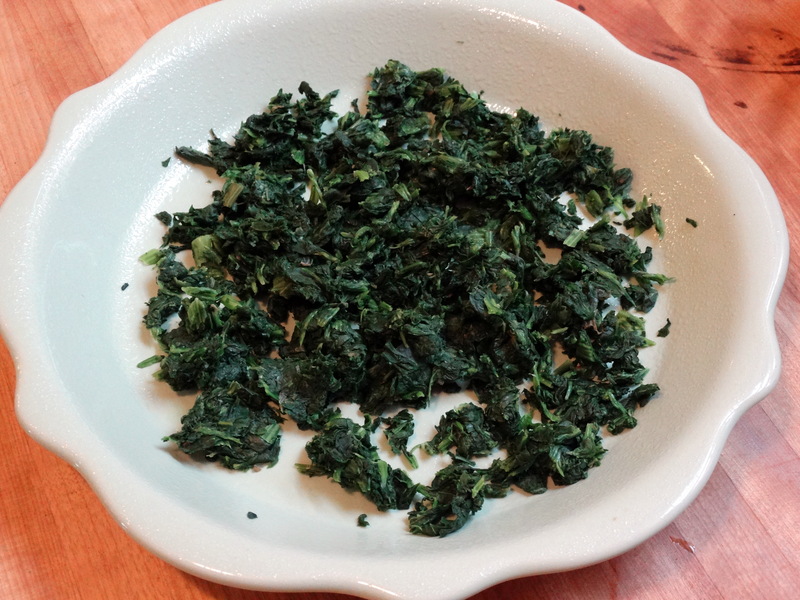 Sprinkle the spinach in the bottom of your pie dish. 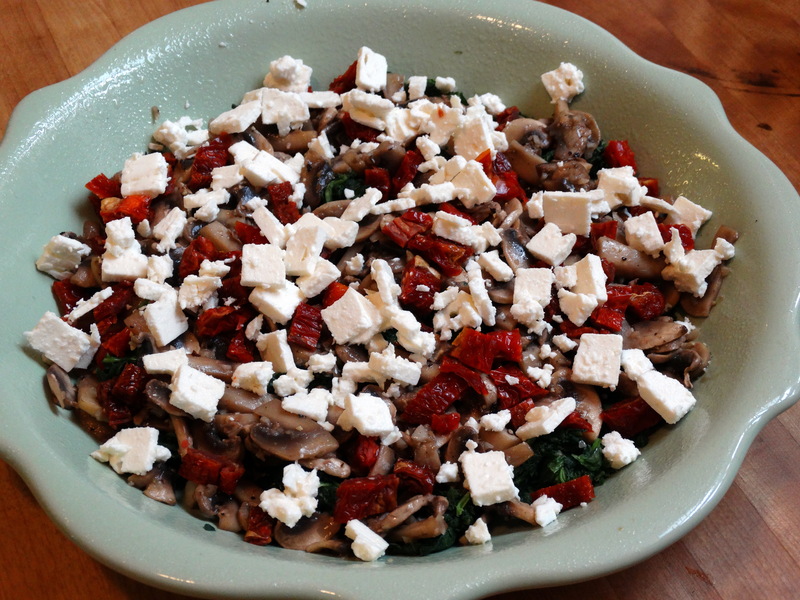 Top the spinach with the mushrooms, sun-dried tomatoes, and 2 ounces crumbled feta cheese. 4) In a medium bowl, whisk together 4 eggs and 1 cup whole milk. Pour over the veggies in your pie plate. Add a bit more salt and pepper if you’d like. Sprinkle the top with 1/4 cup shredded parmesan and 1/2 cup shredded mozzarella. 5) Bake in the oven for 55 minutes, or until the top is golden and the center is firm. Let cool for 5-10 minutes prior to serving and enjoy! Now why didn’t I think of this? Genius. Can’t wait to try it!